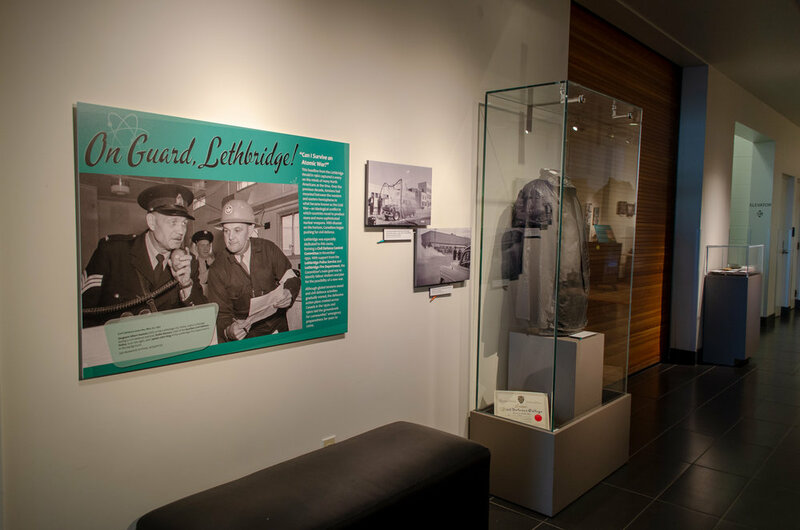 The opening panel and artifacts in the exhibit On Guard, Lethbridge! In November 1951 a Civil Defence Control Committee was formed in Lethbridge, and called for volunteers willing to be trained as wardens, rescue workers, nurse’s aids and administrative staff members. These initial efforts kick-started over a decade of civil defence planning and activity to prepare residents for the possibility of nuclear war. Women involved with nursing were needed because of their specialized skills. Starting early in the 1950s, nurses took part in the simulated treatment of wounded victims in civil defence exercises. They also prepared for various health emergencies or concerns, such as treating nuclear burns and the emergency feeding of displaced individuals. Between 1951 and 1963 a special Civil Defence Police operated in Lethbridge as a volunteer auxiliary unit. They received training from the Lethbridge City Police and retired Royal Canadian Mounted Police members. Three women were among the 20 graduates of a civil defence police training course in November 1959. They took part in mock disaster scenarios, and could be called anywhere throughout the province should the need arise. Although global tensions eased and civil defence activities gradually waned, the defensive action plans created across Canada in the 1950s and 1960s laid the groundwork for communities’ emergency preparedness for years to come.